The tradition of displaying lights at Christmas began long before the widespread use of electricity and the invention of the incandescent bulb. When the practice of bringing Christmas trees indoors was first adopted in 18th century Germany, candles were affixed to the evergreen branches with wax to symbolize Christ, the light of the world. The tradition has come a long way since then, and now brilliant lights of every conceivable size and color illuminate entire cities during the holiday season. These shining beacons still symbolize Christ and hope, and they also serve to brighten the darkening winter evenings as they cast a warm glow on all of our Christmas memories. 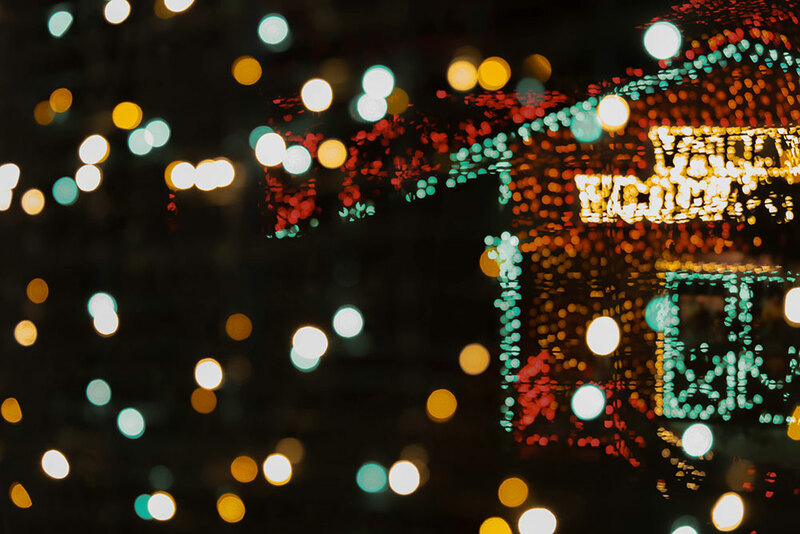 Many of us have fond childhood memories of driving around our town in the family car, feasting our eyes on homes decked out in lights, some with big chunky multi-colored bulbs, others outlined in understated white. A real treat might include spying an animatronic reindeer or snowman on someone’s front lawn, or a friendly Santa perched atop a roof. There is only place where you can feel that familiar hometown charm on a truly astonishing scale – right here at Silver Dollar City®. For two decades, Silver Dollar City’s An Old Time Christmas® festival has been wowing guests and garnering accolades from dozens of national news outlets. 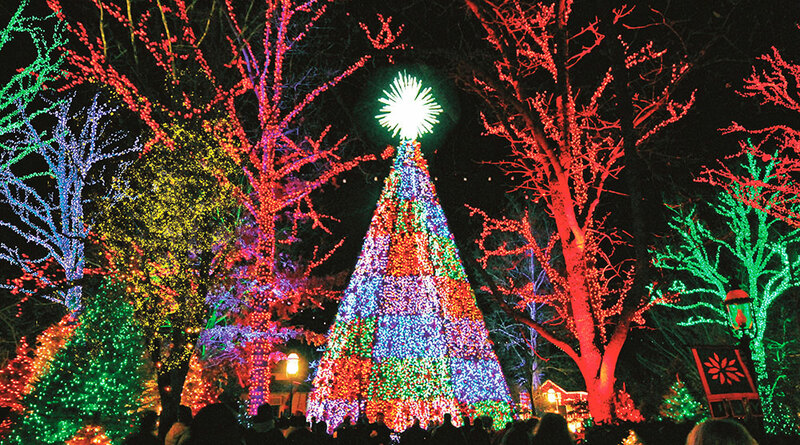 The Travel Channel has called Silver Dollar City, “The Most Illuminated Park On Earth,” and once you witness the dazzling effect of millions upon millions of meticulously placed Christmas lights on every structure and tree within the park, you’ll understand why. True to Silver Dollar City’s ethic of craftsmanship, each and every component of Christmas In Midtown was crafted right here at the park. Additional height has been added to the charming one-story structures in Midtown through the ingenuity of the Maintenance & Construction team who created light-weight temporary facades to raise the decorative potential of the existing buildings. The Visual Team’s carefully chosen garland and hand-made decorative accents provide the finishing touches to complete this magical new Christmas wonderland. 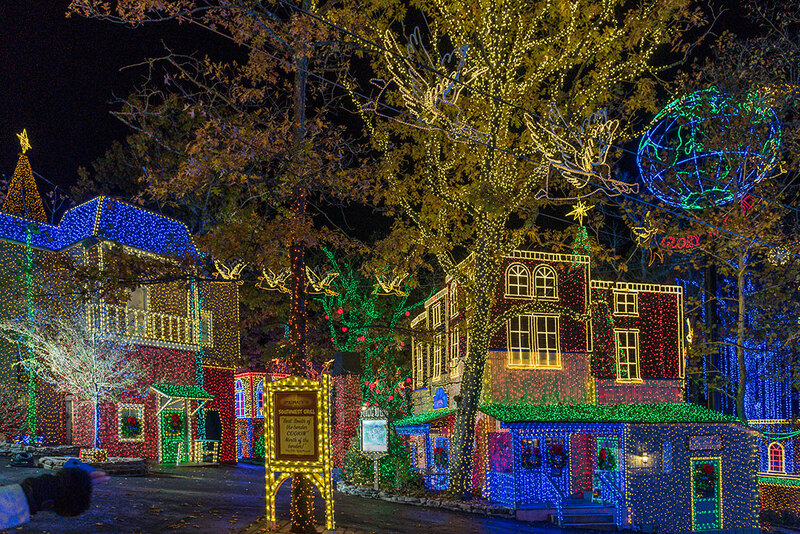 The addition of Christmas in Midtown® brings the total number of lights during Silver Dollar City’s An Old Time Christmas to an incredible 6.5 million. The experience begins the moment you arrive at the park’s entrance where you’re welcomed with the ultimate Christmas photo op, a nearly 25-foot tall lit wreath framing Silver Dollar City’s iconic log and ax. Be sure to stop and snap this Christmas card-worthy shot with your family. Inside the park, on the City’s Square, thousands of LED lights festoon the streets and surrounding trees. At the center of this dazzling spectacle stands a magnificent 5-Story Special Effects Christmas Tree decorated with 350,000 lights and 850 festive ornaments. 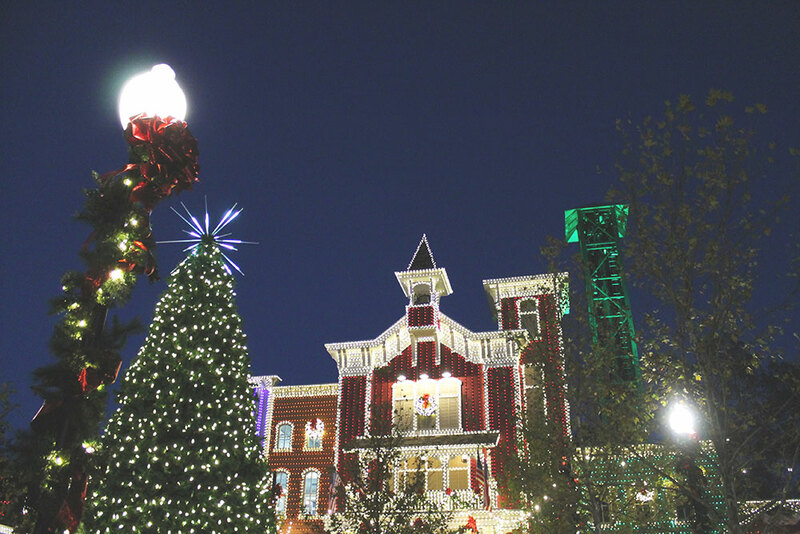 Beginning at 5:20, and at select intervals throughout the evening, this special effects tree comes to life in stunning fashion for Christmas On Main Street, an immersive light and sound experience that will leave you awe-struck. With synchronization timed down to a one hundredth of a second and up to 100 light changes per second, the tree and surrounding Square dance in perfect time to stirring Christmas music. You’ll want to explore every area of the park as you stroll along The City’s streets surrounded by sparkling beauty on every side. 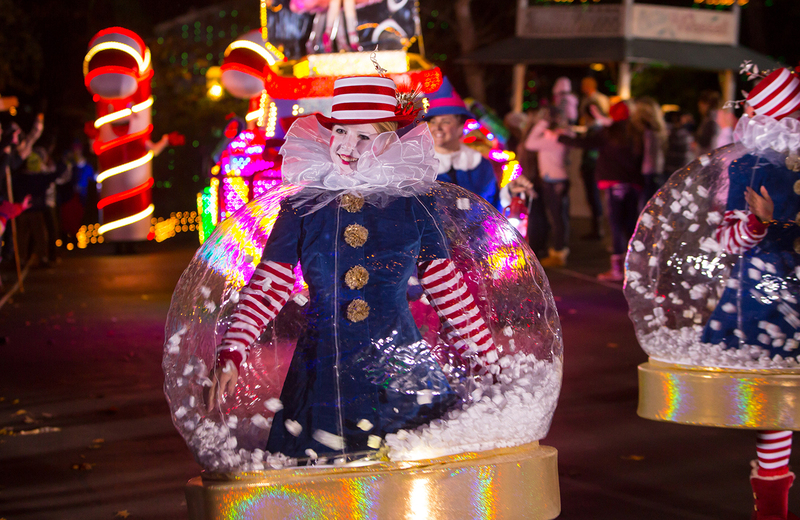 Twice each evening, you can find your spot for another don't-miss feature of An Old Time Christmas – Rudolph’s Holly Jolly™ Christmas Light Parade. Grand Marshal, Rudolph™ leads the parade of nine musical, lighted floats, illuminated with 200,000 ultra-bright LED lights. Each float was designed exclusively for Silver Dollar City, with animated features including huge drumming bears and cymbal-penguins. Forty-five colorful costumed characters accompany the floats including Rudolph’s friend Bumble™ the Abominable Snow Monster, 14-foot moose characters, 12-foot tall elves and 10-foot candy canes, plus penguins, elves, snow globes and a troupe of marching wooden soldiers. 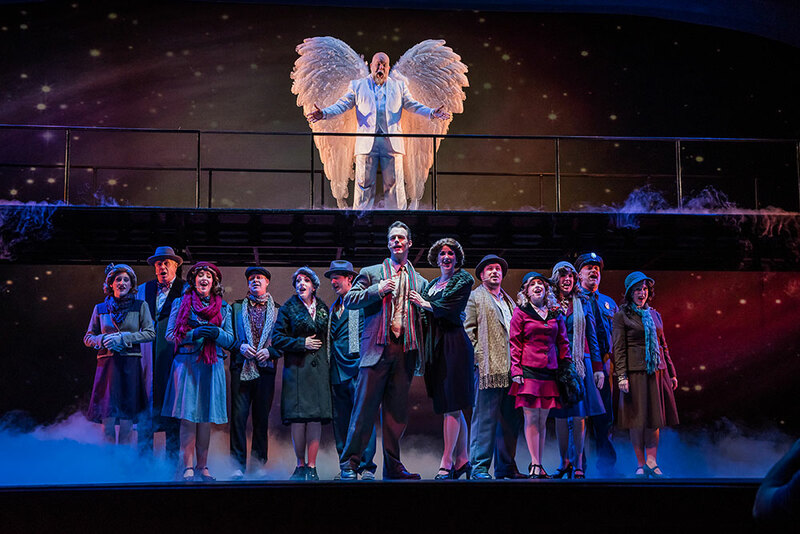 An Old Time Christmas also features festive family entertainment including two Broadway-style shows, meet-and-greets with Santa and Rudolph, hearty holiday buffets, demonstrating craftsmen, unique shops and thrilling rides & attractions (weather permitting). 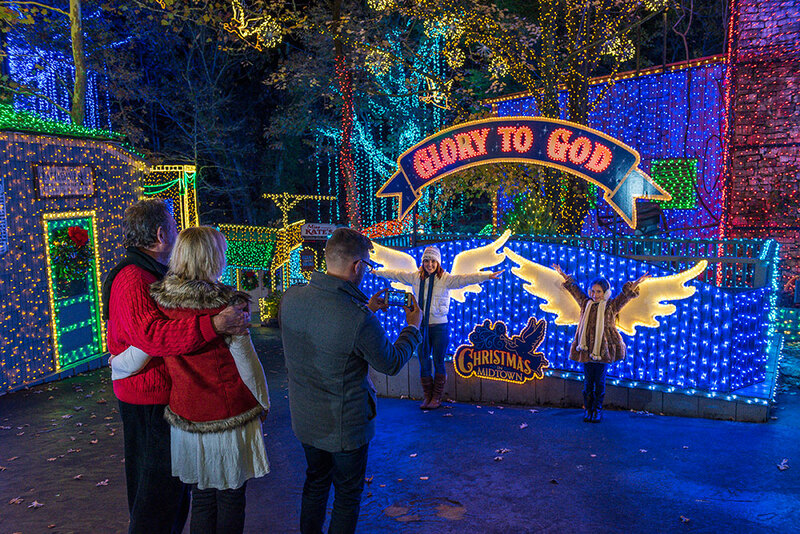 Plan your Christmas visit to Silver Dollar City and make this your family’s brightest holiday season ever!